This is a record of news from our old html website that is outdated. 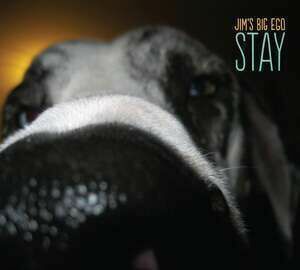 It's been a long time since the last update here, but that's why you have to subscribe this instant to the Jim's Big Ego mailing list. Do it today! Jim and the band have been busy for the last six months spreading the love in Iowa, Minnesota, North and South Dakota, Wisconsin, Chicago, New York, Burlington VT, and of course here at home in Boston. JBE also received a nomination for the 2001 Boston Music Awards for best song (Indie Label) for "Boston Band" off of noplace like nowhere. In any case, Jim's Big Ego will have plenty to offer. The year starts with a long overdue tour to the Washington, DC area. Make no mistake - this has nothing to do with the impending Bush presidency. See below for details. And in February, JBE heads back out to the US Mid-West for an month-long college tour. This time they hit the Frozen Tundra of North Dakota, South Dakota, Wisconsin, Iowa, and Minnesota. There are too many shows to list in this email. Please check the website for dates. First of all, we want to give a warm welcome to the many of you who have joined us since the NPR broadcast last week. We have been overwhelmed by all of your kind words and can't thank you enough for your support. Needless to say, the NPR feature was an unbelievable experience. An estimated 12.5 million people tuned in and as a result, "Little Miss Communication" has been #1 on the MP3.com Power-pop charts since. Blatant Pitch: JBE CDs make perfect holiday gifts and are available for purchase at all fine places where music is sold! Visit Amazon.com or CDNOW or Borders (or wherever you buy CDs) and get some JBE goodness for all your loved ones! We have some really exciting news to share with you so please read carefully! On Wednesday, November 29, NPR's popular afternoon news program "All Things Considered" will feature a show called "The Changing Face of America" which will be narrated by none other than our very own Jim Infantino! To top it off, the show will be all about a certain band from Boston and how they record a song and post it on the web as an MP3 file and then as a Shockwave Single. Guess what band? That's right ladies and germs. Le EGO Grosse du Jim! As a special sneak preview for you, we've made the featured song, "Little Miss Communication", available for immediate viewing and download! Other Ego Bits: - "noplace like nowhere" will finally be available for purchase at ALL local fine music outlets in North America starting this Tuesday, November 21st. Avoid the post-Thanksgiving day rush and get yours now! Tell 'em Jim sent you. Big doings in Egoland this week. JBE returns to T.T the Bear's in Cambridge, MA this Friday night in midst of a massive college tour. 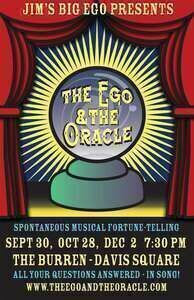 This is your rare chance to catch the Big Ego on hometown turf. Don't miss it! Ego-bit #1 - JBE has a brand-spanking-new web site! And it's all in Flash!! If you're internet connection doesn't blow, click here. Ego-bit #2 - Check out the recently created Shockwave Single for "Concrete"
Ego-bit #3 - The Shockwave Single for "Stress," featured on both Shockwave.com and Wired.com's Animation Express sites, has been viewed over 100,000 times in the few months that it's been on the web! Ego-bit #4 - ABCNews.com interviewed Jim for a piece on the whole MP3 / Napster hoo-ha. To get a glimpse of Sr. Ego's thoughts on the subject, click here. Jim's Big Ego has just signed an agreement with shockwave.com to produce original content for the website's music section! We join a select roster of artists such as Beck, Air, and Moby and will be one of the first ever to create content in the form of "shockwave singles" - animated music videos created with Macromedia Flash. The first JBE shockwave single, for the song "Stress," debuts today at shockwave.com It can be viewed free of charge with the Macromedia Flash Player. The "Stress" shockwave single was conceived and created by New York based Moody Food Design and is one of only four shockwave singles in existence! Go to shockwave.com , click on the "Music" banner and see what all the hype is about. 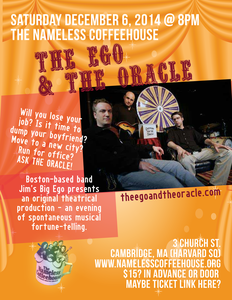 Jim's Big Ego is proud to announce the imminent release of their latest studio effort, "Noplace Like Nowhere". The CD features Jim along with Jesse Flack on upright bass & vocals and Jesse Vena on drums & vocals on twelve tracks of instant Ego-goodness. Tracks include "Concrete", "Angry White Guy" and "Prince Charming" along with a studio version of the fan favorite, "She's Dead" and a new funked-up version of "Stress" that will make your head spin! "This is by far the best stuff we have ever produced," says Jim about the new disc. "There should be one in every pot and a pot in every chicken." PLEASE NOTE that pre-orders will not be fulfilled until mid May. It's been a while since we've been in touch and there's tons to share, so read carefully with both eyes! 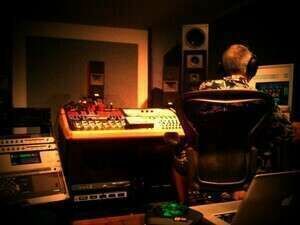 First and foremost, the news you've been waiting for... recording and mixing for the new Jim's Big Ego CD - "no pLacE liKe nowHere" - is finally complete! The band had an amazing time working with the otherworldly talents of engineer/producer Ducky Carlisle and has created what we hope you will think is their finest studio effort to-date. While details about the release are still being finalized you can download a sneak preview of the song "Concrete" by going to our mp3.com site. The song should be up by Saturday, February 26th and will only be there for 30 days. Get while you can! - JBE is featured on Dr. Demento's 30th Anniversary Compilation! This Rhino Records two CD set contains an early version of "Stress" along with many other Demento classics. The compilation is slated for release Tuesday, February 29th and you can find out more from Amazon.com . - ESPN is featuring "Desperate Times" (off "More Songs About Me") during their ski program "White Out". The song is played in its entirety as the backdrop to a melange of ski wipe-outs and accidents! To get a glimpse of this hilarious juxtaposition, check your local listings for show times. a report about the hype over Y2K. In the Boston area, Y2K Hooray! can be heard about a thousand times a day on Mix 98.5 where it is featured as the anchor for the station's "Y2K Song of the Day" promotion. Also in Boston, JBE paid a visit to The River 92.5 studios on October 29th, where Y2K Hooray! has received rave reviews and decent airplay. The band played few songs live on the air and chatted with the River' djs about life, lust and other Ego matters. You can now order Y2K Hooray! with a credit card via our secure server! To place your order, simply click here. In overwhelming response to the amount of attention that the MP3 version "Y2K Hooray!" has received on the internet (a record 5000 downloads to date and a Top-40 favorite on mp3.com), Jim's Big Ego is proud to announce the release ofa special limited edition "Y2K Hooray!" EP. The 5 song CD contains a brand new hi-fidelity recording of "Y2K Hooray!" along with a sneak preview of a new song from the forthcoming full length Jim's Big Ego CD (release date - sometime Y2K...) as well some extra live and demo versions of fan favorites.